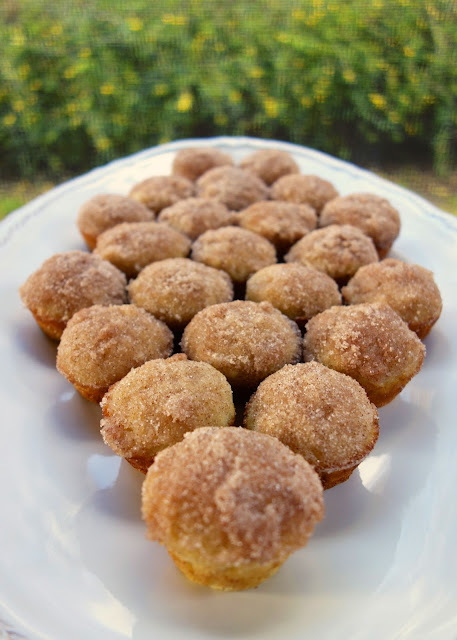 These mini applesauce muffins are so delicious. My favorite part of the muffin is the crunchy cinnamon sugar coating on top. These muffins don't have an overwhelming applesauce flavor; so no worries if you don't like applesauce. The applesauce really helps keep these muffins super moist. The muffins are quick and easy to make. I can whip them up in the time it takes to preheat the oven. They are great for a quick breakfast or an after school/work snack. I think they would be a great treat to make for Mother's Day this weekend. Preheat oven to 350ºF. Lightly spray mini muffin pan with cooking spray. Set aside. Cream 1/2 cup butter and 1/2 cup sugar until light and fluffy. Add eggs, beating well after each addition. Stir in applesauce. Combine flour, baking powder, and salt. Add to batter and stir just until moistened. Spoon batter into prepared mini muffin pan. Fill each 2/3 full. Bake for 12-15 minutes. Remove from oven and allow to cool slightly before removing muffins from pan. Combine 1/4 cup sugar and cinnamon. 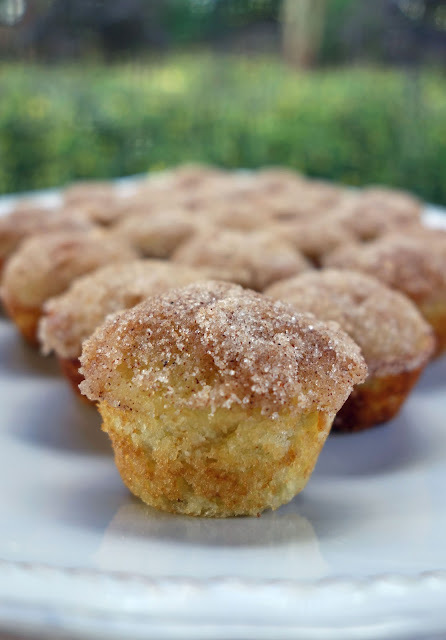 Dip muffin tops into melted butter and then into sugar mixture. This brings me wayyyy back to my mom making mini muffins with the sugar/cinnamon on top!! It's really a simple, but insanely delicious touch! I can't wait to make these. These look really good! And perfect for Mother's Day brunch - thanks! "Pinning"
I didn't care for the overwhelming baking powder flavor. Does it really need 1 Tablespoon? I may have used just a tiny bit too much baking powder as i pretty much eyeballed everything but they were a huge hit for everyone, adults and children alike! Love the butter and cinnamon sugar dip at the end. I added about double the cinnamon. Must try! Could you give me the recipe for the applesauce please? I made these for breakfast this morning. Just yummy. Everybody liked them. I dipped some in plain sugar and some in cinnamon/sugar. Compliments from kids and adults as well. I used 2 tsp. of Baking Powder. Thanks, great recipe. Was looking for more of an apple tast, but maybe it was just the apple sauce I used. Loved the texture though. I also used coconut oil instead of butter.